Safe to children: made of high-quality material with smooth surface, no sharp edges, and using non-toxic paint, super safe for children to play. 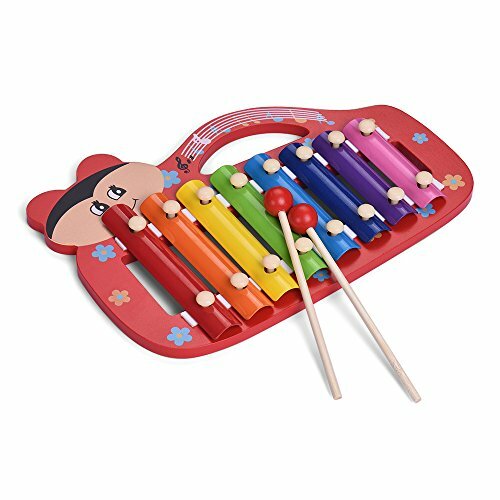 Colorful and cute design: wooden base in cartoon shape, painted attractive patterns, and the metal keys also in different bright colors, children will be willing to play. Easy to play: the metal keys in 8 different notes, just using the included wooden mallets to knock the metal keys to play melodies or simple songs. Help to cultivate children's musical talent: parent can play it with children to train their rhythm sense, or teach children to play by themselves, thus cultivating children's musical ability.